If someday I turn fat, I mean seriously fat, you can blame it on this bittersweet goodness. It leaves me wondering, is there some sort of therapy to battle chocolatey orange peel addiction? Cut peel of each orange in 4 vertical segments. Remove the peels from the orange, and cut into 1/4-inch strips. Using the tip of a paring knife, remove the white pith from the back of the peels. Mix water and 1 1/2 cup of sugar in a medium saucepan. Bring to boil over medium heat, stir to dissolve sugar. Reduce heat and add the orange peels into the sugar water. Let simmer until the peels are soft, about 45 minutes to 1 hour. Drain. Toss peels and 1/2 cup of sugar in a large bowl, separating the peels. Transfer to a lined baking sheet, arrange them in a single layer. Set aside and let sit for 1 or 2 days, until the coating is dry. In a double boiler, mix chocolate chips and heavy cream. Melt the chocolate over low heat, stirring constantly, until it turns smooth and creamy. 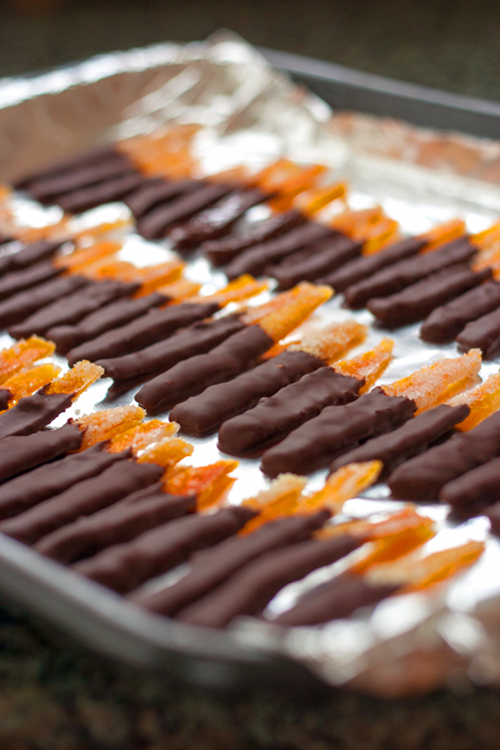 Dip each candied orange peel into the chocolate, transfer to a lined baking sheet. Refrigerate until the chocolate is set. Beautiful :) I love orange peel with chocolate. Citrus and chocolate...Can't wait to try this amazing and unique combination. Thanks for sharing. I have never had this before but they look so soft and chewy...and chocolatey. 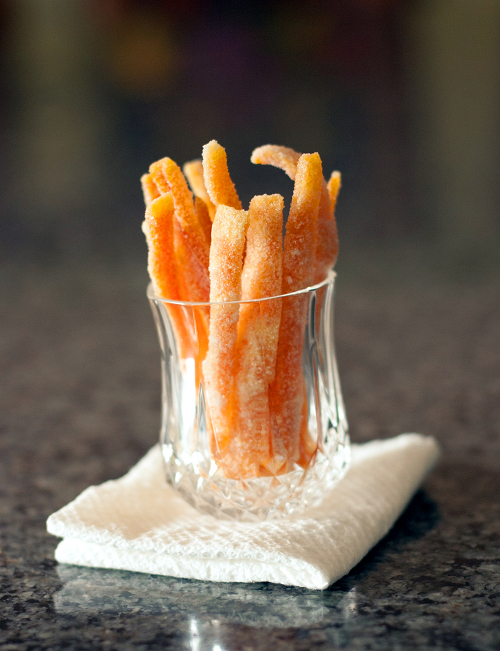 My mother in law loves candied orange peel so this would be perfect for her as a little gift. Absolutely divine! Saving this recipe for the holidays. If I don't, I'd eat them all. LOL. That's exactly what I did! I've always wanted to make these. I think I saw when I first started blogging but never got around to it. It sounded too difficult at the time. I think I might try this recipe very soon. Thanks for sharing! In the ingredients it doesn't say you need lemon, but in the directions it says to add lemon peel... Does it mean add the orange peel?